A different kind of Lovecraft tale skillfully adapted by I.N.J. 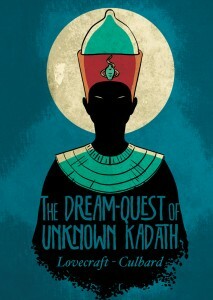 Culbard, The Dream-Quest of Unknown Kadath is a worthy addition to this line of graphic works. In a world beyond the walls of sleep, Randolph Carter goes in search of an opulent and mysterious sunset city. First, he must go to Kadath, home of the Gods, where he hopes to be guided to the city of his dreams. No one has ever been to Kadath, and no one even knows how to get there – but that won’t stop Carter from trying. In this masterful adaptation of Lovecraft’s classic novella, I. N. J. Culbard captures Carter’s journey through the dangerous and spectacular Dreamlands in beautiful, gripping detail. Much different from the previous Lovecraft adaptations, The Dream-Quest of Unknown Kadath is the story of one man’s search for a better world in his dreams. As such it’s a tale of journey and not horror, or thriller depending on how you view Lovecraft’s stories, as we discover this dream world of Randolph Carter. As children, we listen and dream — we think only in half-formed thoughts. As men, we try to remember, but we are dulled and prosaic with the poison of life. We try to make sense of it, but in our efforts we lose its meaning. We glimpse our far forgotten first youth, when wonder and pleasure lay in all the mystery of days…before we were wise and unhappy. Before we were spoilt by reason. And so our journey begins, with Carter entering his dream after meeting with a fellow dreamer who provides the quote above. This is a journey, and as such the story is fairly linear, moving towards the goal while overcoming obstacles and hurdles. It occurs in a dream landscape so the fantastic and bizarre come together to aid and obstruct. The protagonist, the Crawling Chaos Nyarlathotep, is always at the fringes, pressing those Carter encounters and working the marionette’s strings. It’s an interesting finish when the two collide, and of course even with a sunny resolution for the stories’ completion Lovecraft throws in a chilling twist. Characters don’t develop so much as change. Carter maintains his resolve and in the end stumbles upon the truth he was searching for, but it’s just the final steps of the journey. Two friends from the real world make appearances, both rulers of their own dream cities. It’s a strong contrast of light and darkness, well developed visually. Culbard’s art is clean and clear. Inking is kept to a minimum, shading and depth provided through colour. And oh such wonderful colours! The palette is matte and is used to differentiate areas Carter visits, providing clear visual demarcations to the travels. There is a multitude of characters, cultures and creatures throughout, and Culbard has crafted and developed them with aplomb. Of course this is a graphical adaptation of a written work and as such can only use the material provided. I haven’t read Lovecraft’s book but Culbard presents a concise and fluid story. SelfMadeHero has maintained their standard formatting for this volume, 6.5″ x 9.5″ softcover with heavy paper stock and a thick cover with French flaps. It’s a sturdy work that should hold up to multiple reads. $20 for 144 pages makes this a solid value and a worthwhile read for fans of graphic adaptations in general and I.N.J. Culbard in particular.